With heavily anticipated Season 3 of Attack on Titan (Shingeki no Kyojin) coming out this month, it might be time for a refresher on events that transpired in the two previous seasons, season one having aired almost five years ago. This said, for those late to the party who have yet to experience a single episode of Attack on Titan but wish to jump straight in at the same time as everybody else with season three, this guide will help paint a basic picture of what the anime is about with need-to-know events and key characters, mapping out the fundamentals of the series. The series begins one hundred years after the mysterious appearance of humanity’s newest and most deadly enemy: Titans, a race of animalistic humanoid giants who prey exclusively on humans, savagely devouring them by the handful. Their only weak point, located flesh deep in the nape of their necks makes them almost impossible to kill, endangering the entire human species and forcing survivors to retreat and barricade themselves in a fortress of sky high walls behind which they have now been living for an entire century. Life behind the walls is not entirely cushy, most of the land unsuitable for farming making for a somewhat rudimentary lifestyle but at the very least humanity is kept safe behind the hardened walls, strong enough to keep the Titans at bay. A set of three walls are raised in order to keep the peace, splitting the city into three realms: the poor live inside the outer wall called Wall Maria while the more wealthy reside in the innermost wall named Wall Sina home to the upper-class citizenry and the King himself at its centre (Mitras). 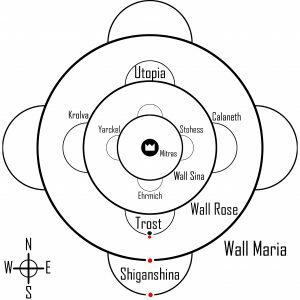 The wall in the middle of Maria and Sina is Wall Rose with all three walls circling around and towering over the remnants of humanity, yet also managing to create a divide in between each class. Keeping the peace inside the walls are the Military Police (horsehead insignia) and the Garrison Regimen (rose insignia), while the Survey Corps (wings of freedom insignia) patrol beyond the walls in attempts to reclaim land, often having to face Titans in direct combat. Although highly skilled soldiers and considered the hope of Humanity, cadets in training still think twice before joining the Survey Corps due to the low mission success rate and shockingly high death counts. If the violent deaths are enough to dissuade most from wanting to wander off outside of the walls, the promise of freedom and knowledge are what motivates the young Eren Jaeger to want to join the Survey Corps one day, the walls more suffocating than protective, making him feel like cattle with humanity too relaxed and comfortable, growing blind to the possible threat of an attack. Too stubborn for his own good, he has little restraint when it comes to keeping out of fights, guided by his own sense of justice. Flanked by long-time friends Armin and Mikasa though, he manages to stay out of too much trouble with Armin, seemingly weak and shy yet smart and rational and Mikasa, strong and coolheaded, loyal to Eren and his family for having saved her from her parents’ murderers. Both friends and family try to dissuade Eren from joining the Survey Corps with the exception of Dr. Jaeger, Eren’s father who acknowledges his thirst for knowledge by promising to reveal to him the contents of their locked basement upon his return. No sooner had he left though than a Colossal Titan appears from behind Wall Maria, tall enough to peer over their fortifications into the faces of the fear stricken inhabitants as it kicks down the first gate into the Shiganshina District letting in floods of famished Titans, devouring all in their wake and leaving Eren helpless as he watches his own Mother get eaten alive. When a second abnormal Titan covered in hardened armour-like skin dashes in to break the North gate of the district, fully breaching Wall Maria and forcing survivors to flee behind Wall Rose, Eren is reminded of Humanity’s weakness and vows to erase Titans from this World. That night as he sleeps, he dreams of his father urging him to get to the basement of their home all the while forcing a mysterious injection onto him. Upon awakening, Eren notices the basement key now hanging from his neck. Five years pass since the incident and Eren, Armin and Mikasa are part of the 104th Training Corps with the firm intention of getting into the Survey Corps. Having mastered the art of fighting while cutting through the air using their military three-dimensional manoeuvring gear (3DMG), a complex grappling hook, gas and blade contraption allowing for an incredible range in motion while facing Titans in combat, all cadets are now finally ready to graduate and to take up their duties. Inexperienced when it comes to fighting real live Titans though, most trainees fall when the Colossal Titan appears the same way it had five years previously and kicks down the first gate of the Trost District which sits in the forefront of Wall Rose, once again letting hungry Titans inside the city. In an attempt to save his friend Armin, frozen in fear before one of the invading Titans, Eren is swallowed whole only to reappear later as a powerful Titan himself, fully capable of taking on other attacking Titans, saving his peers along the way. When his own Titan collapses, Eren is extracted from its remains and is asked by Garrison Commander Pixis to help plug the breach in the wall using his Titan form which appears to come back to life when triggered by physical pain. Struggling to control his Titan at first, Eren finally manages to block the wall with a large boulder, securing Wall Rosa. Perceived both as a threat and as a saviour, Eren faces death while on trial for his unpredictable Titan form. Proving that he is capable of keeping Eren under his control, Survey Corps Captain Levi takes the boy under the surveillance of his squad where Eren learns not only about Titans through Titan enthusiast Hange who has been conducting experiments on two of the captured giants (Sonny and Bean) but also about his own shape shifting Titan and its power of regeneration. When Hange’s test subjects are suddenly killed one night with no immediate suspects found, Commander Erwin decides it’s time to head out beyond the walls back to the Shiganshina District to uncover the mystery behind Eren’s basement. As they ride out to open land, a Female Titan appears displaying intelligent behaviour similar to Eren’s Titan, confirming that there are more than one human controlled giants though not all of them siding with Humanity. A heavy fight follows the Female Titan’s appearance, leaving many slaughtered while others are left purposely unharmed cluing Armin in to the Titan’s true identity. When she escapes, Armin devises a plan to capture Annie Leonhart, a teammate from their cadet days, while she’s still in human form. Now an active member of the Military police, Annie sees through Armin’s ruse, forcing both her and Eren into a mighty Titan battle, leaving a path of destruction in their wake. When an attempt is made to extract Annie from the nape of her Titan’s neck, she forms an impenetrable crystallised cocoon around her human self, trapping and protecting herself at the same time. 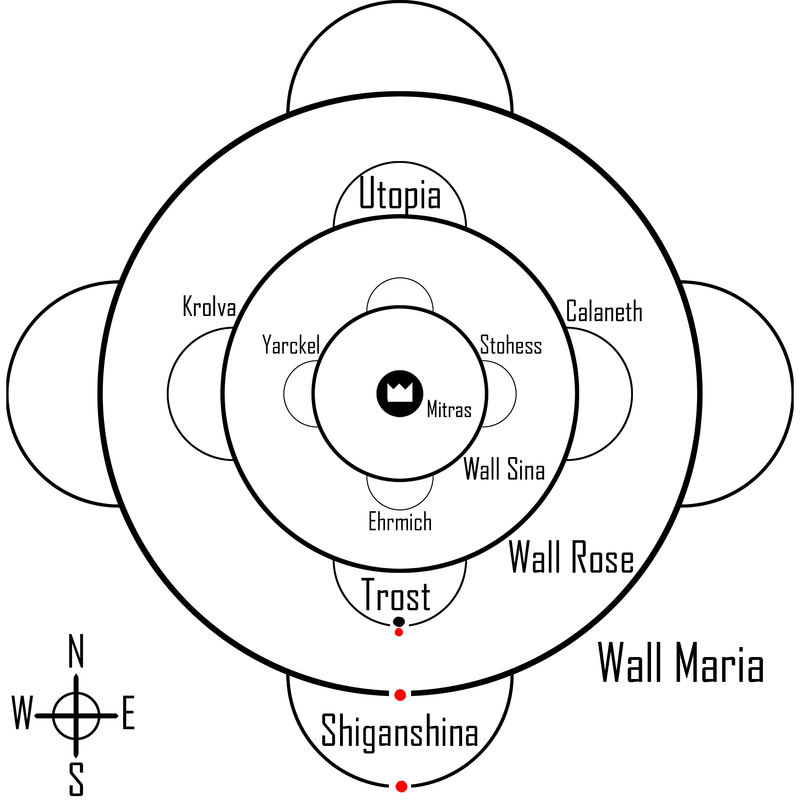 In the meantime, Mikasa notices a Titan within the structure of the walls themselves sending Minister Nick, a worshiper of the Walls into a frenzy, urging them not to let the sun touch the peering face of the Titan inside the wall, his sudden behaviour betraying the Church of the Wall’s apparent knowledge on the Titans and their origins. When pressed, he finally reveals that Historia, a squad member from the 104th division hiding under the name Krista, might have the answers to their questions. Suspecting that Annie Leonhart hadn’t been working alone, trainees from the 104th Corps are isolated and investigated when Titans suddenly appear from inside Wall Rose, implying that it has somehow been breached. As they divide into teams to inspect the wall, an abnormal Titan covered in fur appears, controlling surrounding Titans with human speech while showing signs of curiosity towards the military’s three-dimensional manoeuvring gear. When no breach in the wall is to be found, patrolling teams take refuge inside an empty castle tower but are quickly swarmed by Titans under the control of the Beast Titan where squad member Ymir is forced to reveal her Titan form in order to fight back, confirming the presence of other Titan shifters within the group. When the rest of the Survey Corps arrive to end the fight, two more squad members reveal themselves as Titan shifters to Eren out of despair as none other than the Colossal Titan (Bertolt) and Armoured Titan (Reiner), infuriating Eren and forcing him into a gruelling Titan battle until Bertolt and Reiner manage to escape into the forest, kidnapping both Ymir and Eren in human form. A heavy pursuit follows, led by Survey Corps Commander Erwin himself, the battle through Titan infested lands revealing where loyalties truly lie. With Ymir finally siding with the Titans and Eren having been rescued, the Survey Corps find themselves overrun and surrounded, with Eren and Mikasa suddenly standing before the same grinning Titan that had eaten Eren’s mother five years ago. Overcome by rage triggered by his helplessness before the monster, Eren unlocks a power inside of him that calls surrounding Titans to swarm and devour the grinning Titan, causing Reiner, Bertolt and Ymir to flee from the fight. More determined than ever to rid the Planet of Titans, Eren agrees to plans to repair Wall Maria using his Titan’s hardening skills the same way Annie had shielded herself behind an impenetrable crystal while Connie, one of the squad members who had patrolled around the wall reports to Commander Erwin his findings, having discovered a Titan that reminded him of his own mother lying on top the remains of his family home, hinting at the possibility that Titans may be originating from humans. Season two of Attack on Titan leaves us pondering over the origin of Titans and the abnormalities which animates a select few of them. Skilled Titans, shape shifting Titans and now with the speaking Beast Titan making its way over the wall, ending the series with a lasting image of the silhouette of the mysterious man controlling the beast, season three of Attack on Titan is sure to raise as many questions as it answers; one of them being: what has the Church of the Wall been hiding about the Titans’ true origins? Currently based in Brussels, freelance illustrator and filmmaker Madeleine Evrard is always on the lookout for new creative challenges. 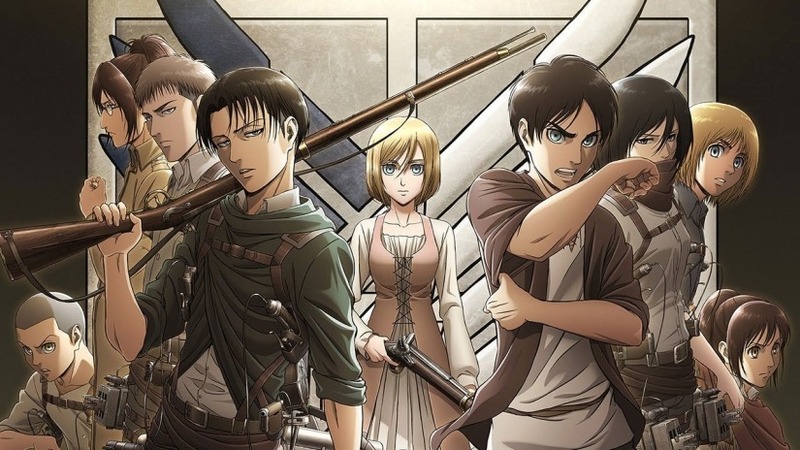 This entry was posted in ANIME and tagged anime, anime news, anime recap, anime release, attack on titan, horror, recap, shingeki no kyojin, summer release, thriller, titan. Bookmark the permalink.